Cleveland State University, downtown campus. Carl Topilow and the Cleveland POPS Orchestra at numerous concerts and events throughout the Orchestra’s concert season. 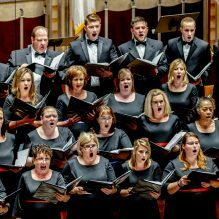 Most performances will take place at Severance Hall and Playhouse Square Center. The chorus will rehearse on most Monday evenings from September through May. Singers (ages 18 and up) wishing to audition must have previous choral experience and demonstrate good tone quality and sight-reading skills. Applicants will be asked to prepare a solo that best demonstrates their vocal abilities. There is a piano in the audition room, but no accompanist will be provided. If you have no accompanist, please bring a recording of your accompaniment, as well as a copy of the sheet music. You must fill out the audition form and attach it to your email.